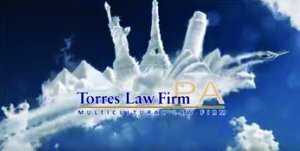 Torres Law Firm is a multicultural firm located in the North Central Florida area. The company seeks to communicate with clients in their native language and also specializes in all phases of immigration law, personal injury and criminal defense cases. I had the opportunity to work with Cary Torres, the owner and founder of the firm, in a commercial that would be aired during the FIFA World Cup on Telemundo throughout the North Central Florida area. Ms. Torres approached me with a proposal to create commercial spots that would run throughout the duration of the Word Cup. I met with her, and we put the commercial together in conjunction with Cox Communications using her image and voice to make it more personal. We then shot a video in her office – turning her lobby into an on-location set. We had a great time filming it, I edited the video footage and sent the completed product to Cox that night – right on time for the first day of the matches for the FIFA World Cup. My next step is for my team and I to develop a conceptual commercial in both Latin and English that Ms. Torres will be able to use to extend her reach.